« Is agreement in number between pronouns and the nouns they represent disappearing from Spanish? Practicing your Spanish is a great reason for visiting Spain, but who wants to do that? Oh, that’s right, you do and I do. But in addition to that, there are other great reasons. I’ll let the following pictures take the place of about 27,000 words. 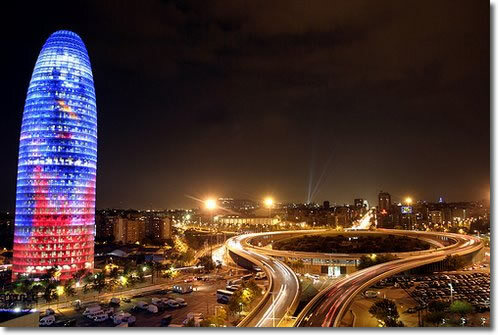 They really light up the Agbar Tower at Glòries in Barcelona. 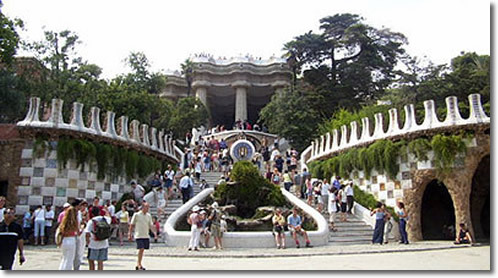 The entrance to Gaudi’s Güell Park in Barcelona, looks like an enchanted place. This is one of about 70 municipal parks in the city. 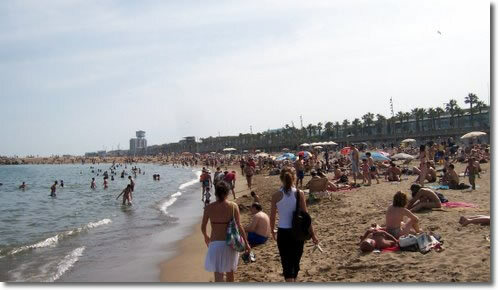 If you’re tired of the parks, take a stroll on Barcelona’s beaches. 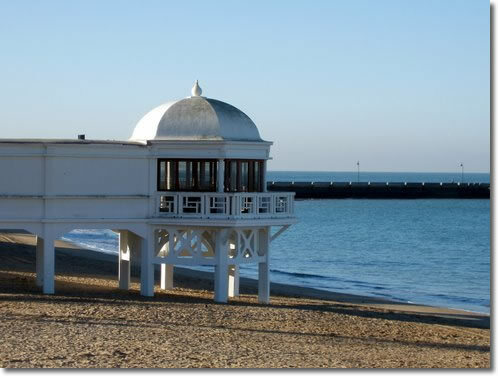 You might also like the beaches of Cádiz. 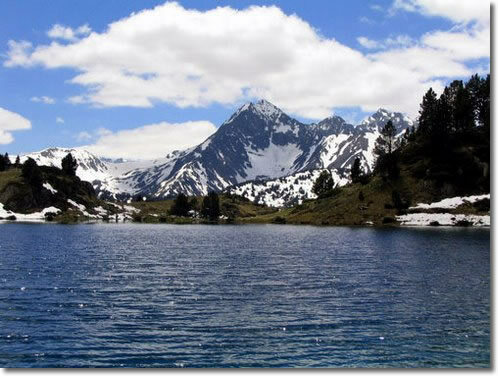 The Aran Valley in Catalonia looks like a really inviting place. 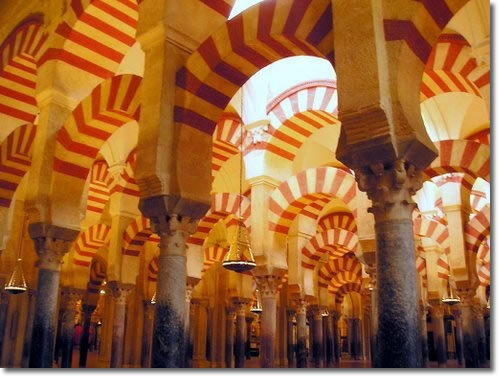 The Mosque or Mezquita in Córdoba has some really colorful pillars and arches. You get to fly into one of the most colorful airports I’ve seen. 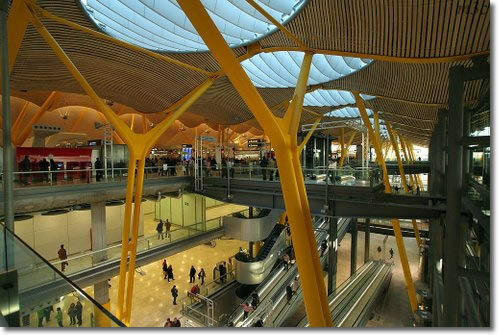 This is the Barajas International in Madrid. 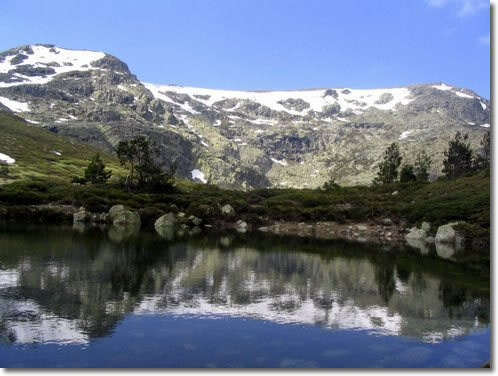 La Peñalara is the highest peak in the mountain chain Sierra de Guadarrama. 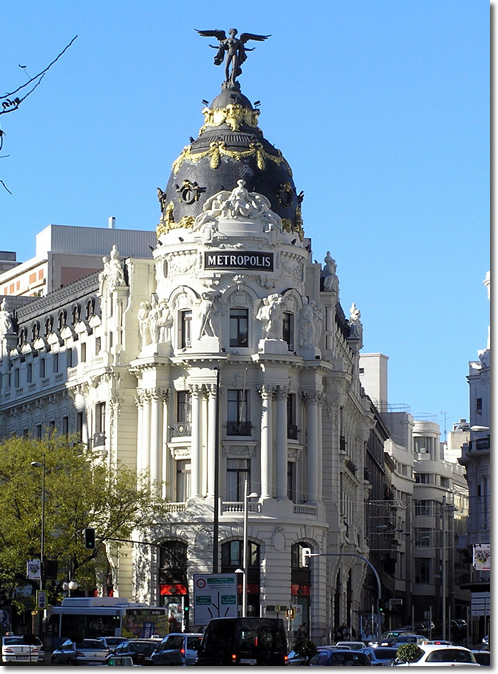 The Metrópolis building, on Gran Vía. 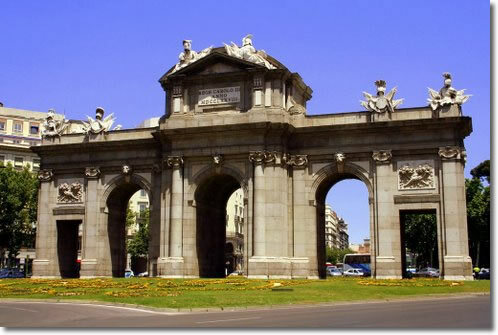 The Puerta Alcalá at the entrance to a park called El Retiro. 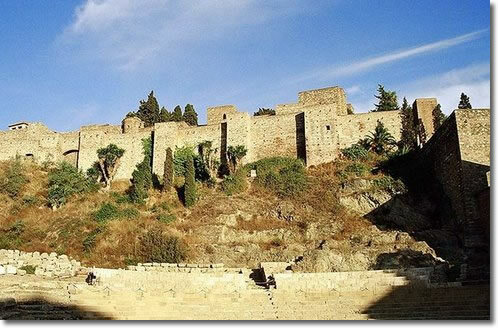 The Alcazaba, an 8th centruy Moorish fortification stands over a Roman theater in Málaga. 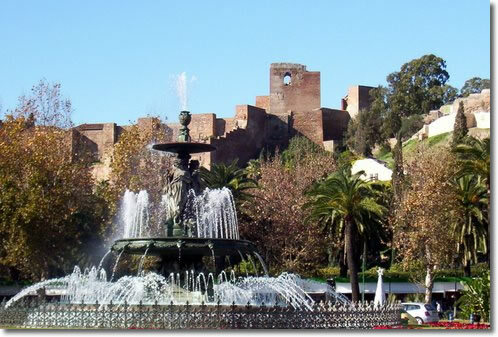 The Castillo Gibralfaro, on a hill next to the Alcazaba in Málaga. 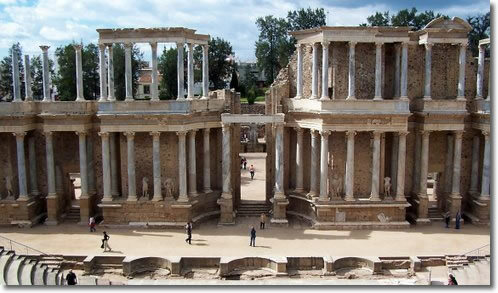 A Roman theater in Mérida. 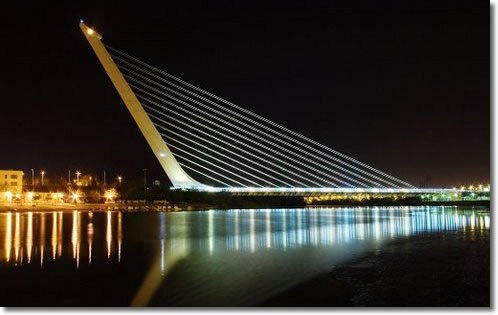 The Puente Alamillo in Sevilla. 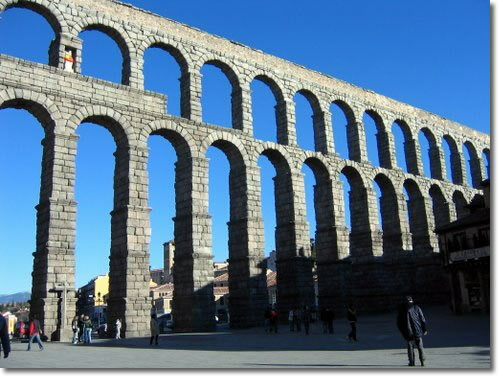 The Romans sure built a lot of aqueducts and theaters in the Iberian Peninsula. This one’s in Sevilla. 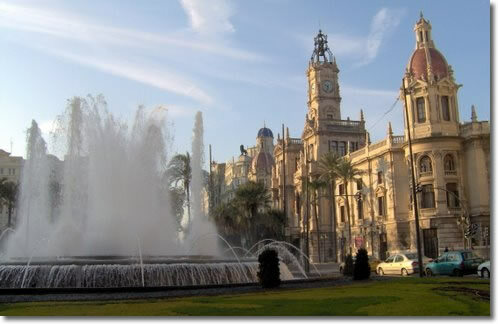 City Hall behind a fountain in Valencia. 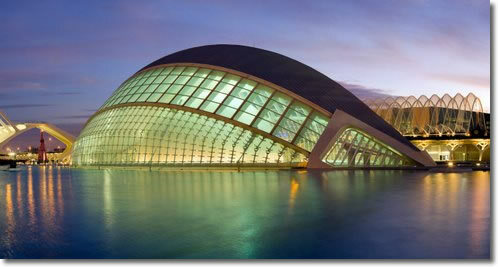 This rounded glass building known as L’Hemisfèric is an Imax theater, Planetarium and Laserium in the Ciudad de las Artes y las Ciencias in Valencia. 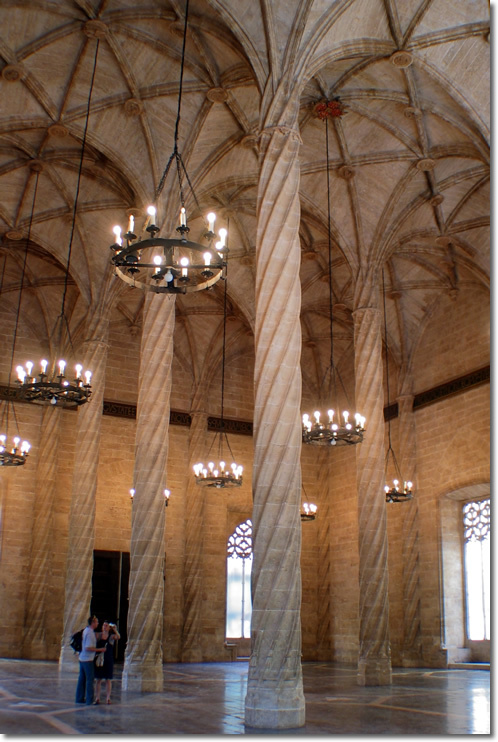 La Lonja de la seda, known affectionatly as La Lonja, was built as an oil market and was later used as a silk exchange. 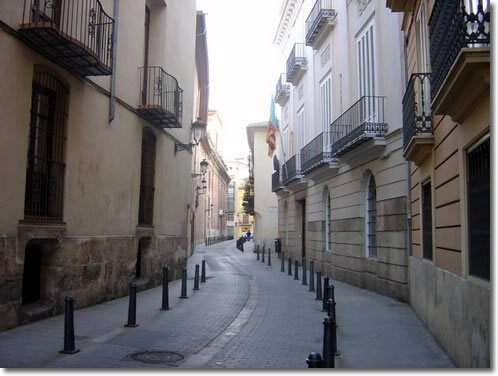 A typical narrow street in the old part of town, Valencia. 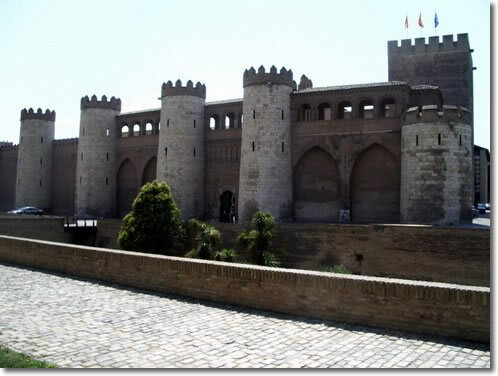 The Aljafería, an 11th century Moorish palace and castle in Zaragoza. 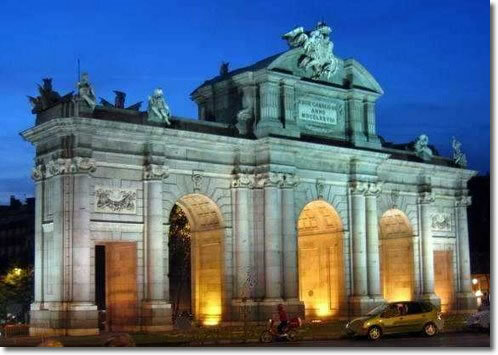 La Puerta del Carmen, Zaragoza. 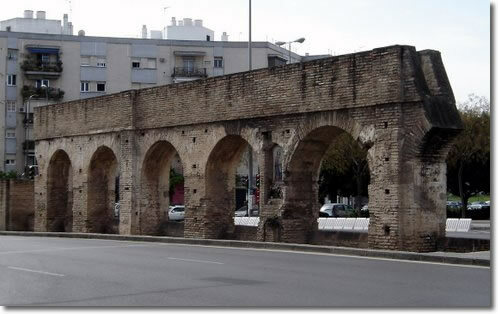 Wouldn’t it be interesting to drive down a modern thoroughfare and drive by this? 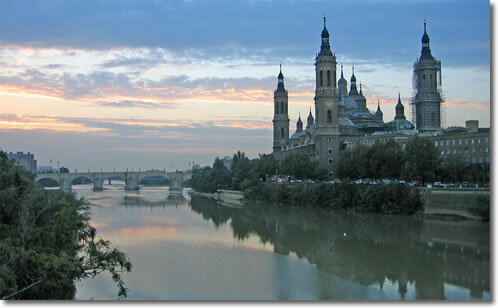 The River Ebro running through Zaragoza. Looks like the setting for a Harry Potter book. 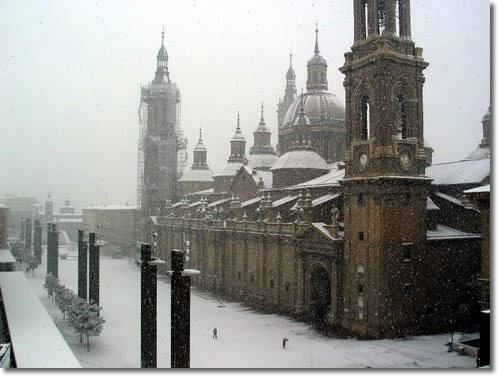 A snowy afternoon at Pilar’s square, Zaragoza. 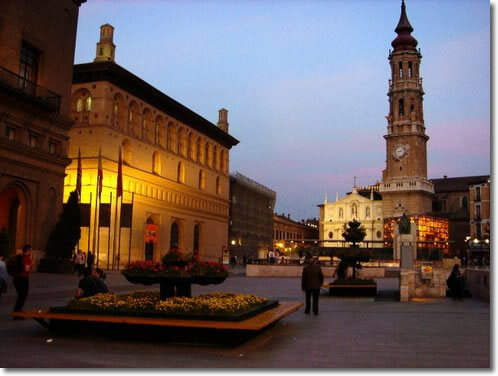 Plaza de las catedrales, in Zaragoza. Picture credit goes to Wikipedia and the volunteers who create it. 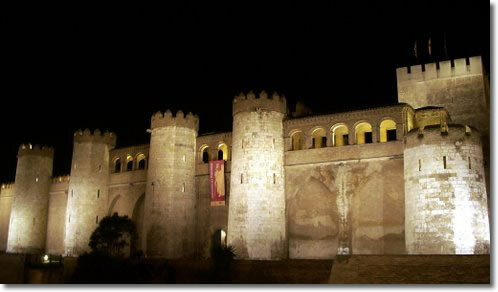 You can find these pictures by starting at the article about Spain and following links to other articles. does anyone need a reason? Check it out, looks exactly the same. thanks for the article… i like it.. stumble up.. The Metrópolis building is looking awsome.. i like it.. thank you guys..
You all forgot Galicia,Ive lived here ten years,I live on the border with Portugal, That,s very nice to.I launch my business next year,check out http://www.galiciantours.com If you like the real Spain,come here. Adios. 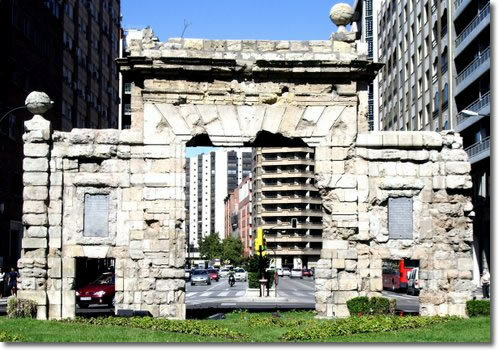 Nice picture collection of a very small portion of a great old country. I’m originally Spanish myself though now a 27 yr. US subject. In all 7 regions and the Canary and Balearic Islands there is so very much more to photograph that this could easily be a 270 collection of pictures and still be just a thumbprint of Spain. Absolutely you all must go, and the sooner the better, even if you are poor! Politically Spain is a Monarchy under a single crown organized like a federation of 7 Regions with a total of 50 provinces, if aI remember correctly. You had me at “Visit Spain”. And why exactly would you say that? An autonomous region does not a sovereign nation make. @Skye Jade – I didn’t know about the Sundial Bridge, but I found some info on Wikipedia! @Fernando, thanks for the info! @Tomisimo – terrific post and great pics! 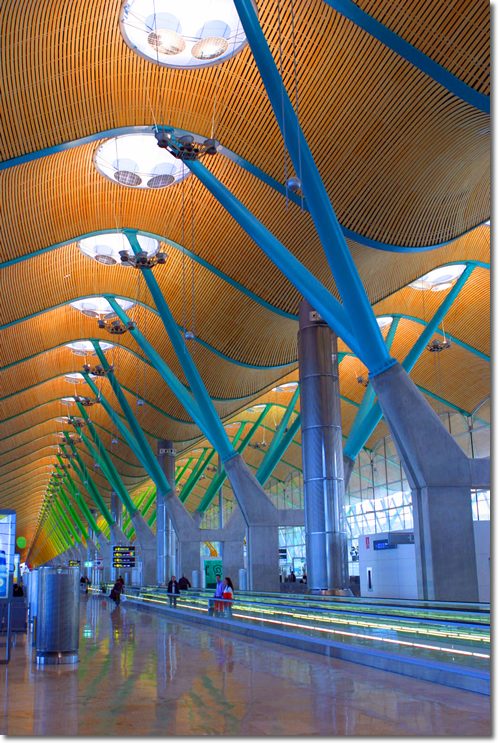 @Ani & Howard Hoyle – I visited Santiago de Compostela and other areas in Galicia a few years ago and LOVED it, so much so that I wrote a web page (w/ lots of photos) on Squidoo about all the amazing places I saw and experiences I had there. The page is here – – if you’d like to check it out. imlj Thanks for the phot,s my friend,They are great,Glad you liked Galicia, Adios H.
Love the photos. 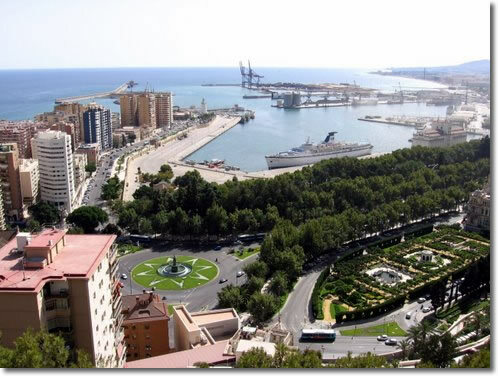 I live in Spain and love the place. Spain looks like a great place to visit. 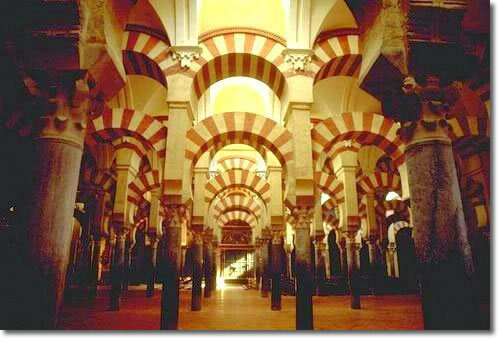 wow a beautiful place in Spain! I hope to visit there! !thumb up! Though you forget many things, as the cathedral of Burgos (and the incredible snowstorms in winter on the city :O), the wines “Rioja” xD, Europa’s Peaks in Asturias …. and much more!